Now known as Jade, the woman begins to recall fragments of what led her to this place, and she realizes the danger isn't over. Jade and the cynical Hawaiian investigator attempt to reconstruct the threads of her identity, but the stakes are far higher than either expected. 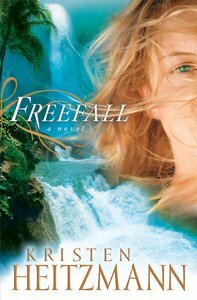 Set on the Hawaiian island of Kauai, FREEFALL commences with a woman tumbling down a waterfall and the testing of Monica Pierce's fragile emotions. Monica's instinctive compassion welcomes the beautiful but injured stranger into her home, her memory lost due to the traumatic fall. Monica names her Jade. As a result of a tragic childhood, Monica has always relied heavily on her protective older brother, Cameron, an insurance fraud investigator living on the mainland. Monica calls him to utilise his investigative skills to determine Jade's identity. Upon his arrival, Jade's reluctance to contact the police sends Cameron's suspicions into overdrive and puts the survival of an unknown man at risk. When Jade's identity is confirmed as the latest Hollywood "it" actress, Gentry Fox, the ugly side of such fame, threatens to overwhelm her as she struggles to remember her past. Cameron's immediate derision of her occupation and the lifestyle he imagines Gentry has sought, is tempered by Gentry's strength of character, which emerges as they search for answers to the tragedy that rocked her. In turn, Gentry glimpses Cameron's cynical and hardened exterior for what it is, a damaged heart and soul, following the early loss of his parents and his wife's more recent betrayal. Cameron resists his attraction to Gentry as danger continues to haunt her. The suspense ramps up and the relationships between all characters are tested as unscrupulous people seek to destroy Gentry's image and possibly, her life. Kristin Heitzmann has written a powerful novel of suspense alongside a beautiful character study of the fragile yet indestructible nature of human emotions. Her characters have depth and authenticity, from Gentry and Cameron, through to blind Okelani, Monica and police officer, TJ Kanakanui. The book delves into issues of integrity, the allure of wealth, the burden of guilt and the miraculous and forgiving nature of God. While Heitzmann's earlier books, SECRETS and UNFORGOTTEN, are must-reads, she has even trumped those with FREEFALL.